The discovery of a drum of highly-hazardous material forced the closure of a residential area. 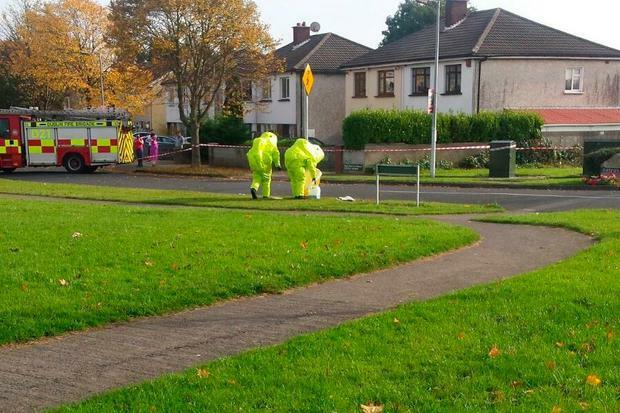 The large container, which contained a chemical substance, was discovered on Oatfield Drive, near the popular Finches pub in Neilstown, Clondalkin, Dublin. Dublin Fire Brigade attended the scene following a call from a concerned member of the public. The drum had been abandoned at the side of the road in the residential area. A Dublin Fire Brigade spokesperson told the Irish Independent the drum was 25-litre in size and contained a dangerous substance called trichlorobenzene. Crew members in protective suits removed the chemical substance from the scene. "We got the first call at about 11.30am and the area was deemed safe again at approximately 1.30pm," the spokesperson said. "The drum was discovered at the side of the road." The substance is a high-temperature solvent which is regularly used as a sealant on boat exteriors. However, it is potentially dangerous to humans as it can be a respiratory irritant. It can damage the liver and kidney and there are strict recommendations on exposure for workers who use the chemical. It is also deemed an environmental hazard. Emergency services understand youths searching for palettes for a bonfire may have taken the container before abandoning it on the side of the road. The discovery came as Dublin Fire Brigade geared up for its busiest night of the year. On Sunday night, an out-of-control bonfire resulted in two lanes of one of the country's busiest roads being closed off. Dublin Fire Brigade attended the incident beside the M50 near the Red Cow junction. The bonfire stockpile is understood to have been placed right beside the motorway fence. The fire quickly got out of control and engulfed the motorway fence, causing disruption to traffic. Emergency services attended the scene and ensured the road was made safe.